Salvo's – Restaurant Review. The famous Italian restaurant in Headingley, Leeds has had a facelift - How does it look and is the food still as good as ever? As a relatively new(ish) resident of Leeds, it’s always good to get local restaurant recommendations and Salvo’s has been on almost everyone’s list. After venturing only once before a couple of years ago I am delighted to be visiting again. Opened by the Dammone Family in 1976, Salvo’s remains a family run eatery. The numerous award-winning restaurant has been a consistent on Otley Road in Headingley for 40-years. 2017 sees the venue complete their biggest refurbishment to date. 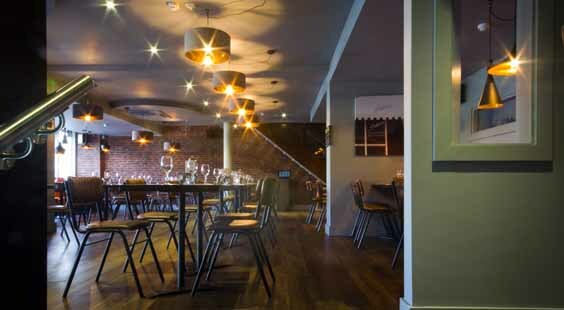 It gives the establishment a new look and a sleek New York style, with walnut furnishings and low-hung lighting. Entering the restaurant, we are greeted immediately at the door and taken straight through to our table by the window. After asking for recommendations on the wine, my friend and I opt for the Viognier (£22.50 for 750ml bottle) which is medium to taste, crisp and fruity. As a foodie, I’ll always ask for recommendations in a restaurant. This way, you know you’re eating the best of the venues offering. So, as the evening’s Restaurant Manager, Andrea, suggests we share three starters; Polpette (£7.50), Carpaccio (£10) and the Burrata (£7). The Polpette (spicy pork meatballs) is packed with the finest quality pork with pockets of spice from the ‘Nduja (a spreadable pork and spice mix). It’s delicately balanced and you do not lose all the other fennel and tomato flavours. Definitely a crowd-pleaser. The Carpaccio is tangy and pleasant, if slightly overshadowed by the meatball flavours. However, for those who want a light and fresh starter, this is a great option. The third starter is the Burrata. This is new to me; a ball of mozzarella cheese oozing in the middle with a creamy cheese filling which flows over the roasted red peppers and Carta di Musica. This is a thin stretched-out bread literally meaning ‘music sheet’ in reference to its paper-thin shape. It is so thin before cooking that a sheet of music can be read through it. This was by far the winner in the starter game. The only way to eat it is to throw away the knife and fork and stack the peppers and creamy cheese onto the bread pieces. I would happily eat another. After a nice break between courses we now have our main course, again to share. 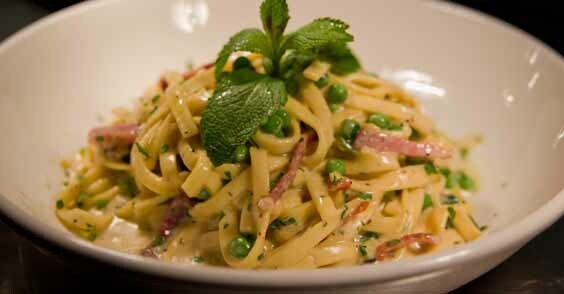 We choose the more traditional Italian mains; pizza and pasta! The Francescana Pizza (£11) is covered in Yorkshire (of course it is!) ham and mushrooms and is cooked to perfection in the new coal-fired pizza oven. There’s a classic thin base with crispy edges. Another recommendation for the main is the Bucatini Alla Carbonara (£12), the pasta cooked perfectly al dente with little pieces of meat and egg yolk to give it the creamy coating. The only disappointment? We can’t finish it. To save us rolling out of there full to bursting we ask for a doggy bag for leftovers. Salvo’s happily oblige. After the perfect suggestions for both starter and main, we aren’t sure if we can even manage a dessert. But to end the meal we choose to share the Gelati E Sorbetti (£5.95). Three scoops of the ice cream or sorbet of the day. The scoops of Hazelnut, Pistachio and Lemon Sorbet finish the meal perfectly. As the evening draws on, Salvo’s is getting busier and busier with only one or two empty tables all evening. I would highly recommend booking so you don’t miss out, although a drink at the new bar and the enticing cocktail menu would surely ease any waiting time. What is noticeable is the variety of people in the restaurant; families, couples, groups of friends young and old and solo diners. This place attracts a variety of people – and that’s one of the reasons Salvo’s remains popular 40-years on. It is open to all and the staff greet everyone like an old friend. Service is extremely attentive and staff are knowledgeable and keen about the food they are serving. The managers approach tables to ensure all is well with their evening. The refurbishment has given Salvo’s a new lease of life and one that will hopefully continue for at least another forty years. I will most certainly be back, even if it’s just for some more Burrata. One Comment on "Salvo’s, Headingley, Leeds – Restaurant Review"
Meal then a parking fine that’s spoil the day.